The time and clock are different for different countries. If in country A there is a day then in country B there may be day or night or different time zone. The sun rises in the morning.It rises in the east direction. The sun sets in the evening.It sets in the west direction.. Between sunrise and sunset -----> Day time. Between sunset and sunrise -----> Night. There are two ways of writing time. First way is use hours from 1 to 12. The second way is use time hours from 1 to 24, here the period is of 24 hours. So for PM, after 12 we count 13,14,15,...,24. Now here you can see the actual clock. There are two hands in it 1) hour hand 2) minute hand. 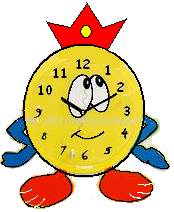 Hour Hand : It is shorter hand in a clock. It moves slowly. Minute Hand : It is longer than the hour hand and it moves faster. If the hour hand is at 10 and minute hand is at 12 then we say that its 10 o'clock. Write the time according to the position of hour and minute hand.